The Russian Helios-40 is one of the greatest lenses made in the USSR. This lens has a 39 mm SLR mount, and was intended for use with the early Zenit cameras (Zenit, Zenit-S, Zenit-3, Zenit-3M, Kristall), but its optical registration (back focus) is the same as in the Universal Pentax Screw Mount, so with a simple 39 to 42 mm adapter ring (not included, available separately) the Helios-40 can be used with any 42 mm Pentax Screwmount camera. The lens is large, heavy, it has a lot of glass and metal. The aperture is a "preset" type - there are two rings. You set the aperture with one (it has stop-clicks), and after the focusing is completed, you close the aperture to the preset value with the second ring without taking your eye from the viewfinder. The lens has a built-in 3/8" tripod mount. The lens has a very "shallow" depth-of-field, and this allows to make great portrait pictures. You can easily control the sharpness of the background with the aperture. M39x1 mm. This is the same mount as in the Leica Thread Mount Lenses, but the optical registration is different. The glass is coated; the barrel has a polished aluminum/chrome finish. This Helios-40 lens was made by the KMZ plant in 1965. It is in EXC condition, the exterior shows little use, mechanics are smooth and the glass is clean. The lens comes with 3 filters, both lenscaps and a lether case.. 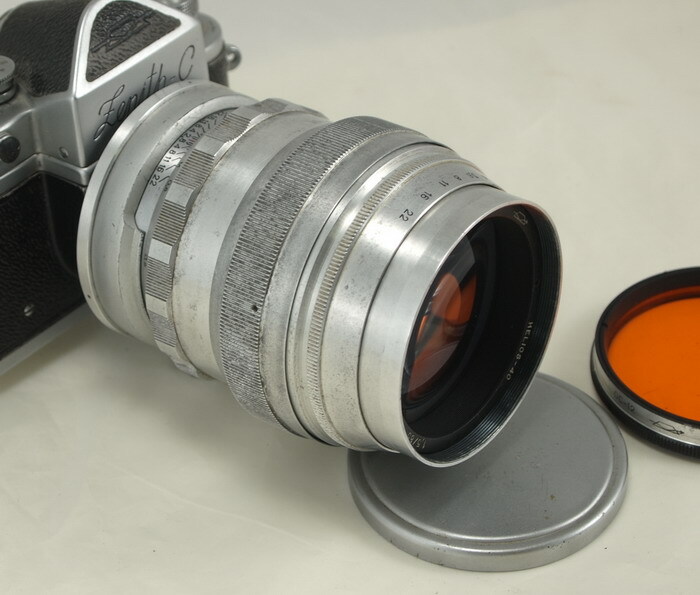 The lens is shown on a Zenit-S SLR (camera not included).